Figure from reference 1: Self-assembly of supported lipid bilayers. Chen, S.-Y., Kristiansen, K., Seo, D., Cadirov, N.A., Dobbs, H.A., Kaufman, Y., Schrader, A.M., et al. (2018). Time-dependent physico-chemical changes of carbonate surfaces from SmartWater (diluted seawater)-flooding processes for improved oil recovery. Langmuir (JUST ACCEPTED). Abraham, S., Heckenthaler, T., Bandyopadhyay, D., Morgenstern, Y., Kaufman, Y. (2018). 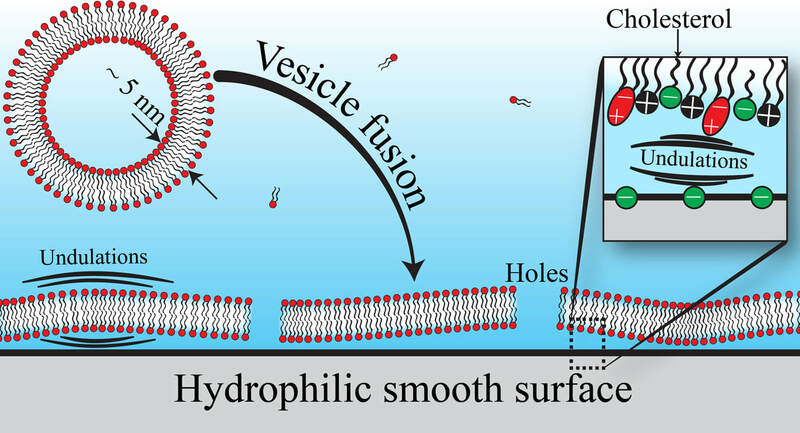 Quantitative Description of the Vesicle Fusion Mechanism on Solid Surfaces and the Role of Cholesterol, Journal of Physical Chemistry C (JUST ACCEPTED). Bone, S., Alum, A., Markovski, J., Hristovski, K., Bar-Zeev, E., Kaufman, Y., Abbaszadegan, M., (2018). Physisorption and chemisorption of T4 bacteriophages on amino functionalized silica particles. Journal of Colloid and Interface Science 532:68–76. Yu, J., Jackson, N.E., Xu, X., Morgenstern, Y., Kaufman, Y., Ruths, M., de Pablo, J.J., et al. (2018). Multivalent counterions diminish the lubricity of polyelectrolyte brushes. Science (New York, N.Y.) 360:1434–1438. Seo, D., Schrader, A.M., Chen, S.-Y., Kaufman, Y., Cristiani, T.R., Page, S.H., Koenig, P.H., Israelachvili J.N. (2018). Rates of cavity filling by liquids. Proceedings of the National Academy of Sciences 248:201804437–6. Ziemba, C., Khavkin, M., Priftis, D., Acar, H., Mao, J., Benami, M., Gottlieb, M., et al. (2018). Antifouling Properties of a Self-Assembling Glutamic Acid-Lysine Zwitterionic Polymer Surface Coating. Langmuir:acs.langmuir.8b00181–15. Singh, S.P., Ramanan, S., Kaufman, Y. and Arnusch, C.J. (2018). Laser-Induced Graphene Biofilm Inhibition: Texture Does Matter. ACS Applied Nano Materials:acsanm.8b00175–8. Dobbs, H.A., Kaufman, Y., Scott, J., Kristiansen, K., Schrader, A.M., Chen, S.-Y., Duda, P., III, et al. (2017). Ultra-Smooth, Chemically Functional Silica Surfaces for Surface Interaction Measurements and Optical/Interferometry-Based Techniques. Advanced Engineering Materials 20:1700630–9. Yair Kaufman, Szu-Ying Chen, Himanshu Mishra, Alex M Schrader, Dong Woog Lee, Saurabh Das, Stephen H Donaldson, and Jacob N. Israelachvili, A Simple to Apply Wetting Model to Predict Thermodynamically Stable and Metastable Contact Angles On Textured/Rough/Patterned Surfaces, ACS Journal of Physical Chemistry C, 2017. Szu-Ying Chen, Yair Kaufman, Alex M Schrader, Dongjin Seo, Dong Woog Lee, Steven H Page, Peter H Koenig, Sandra Isaacs, Yonas Gizaw, Jacob N Israelachvili, Contact angle and adhesion dynamics and hysteresis on molecularly smooth chemically homogeneous surfaces, Langmuir, 2017. Szu-Ying Chen, Yair Kaufman, Kai Kristiansen, Dongjin Seo, Alex M Schrader, Mohammed B Alotaibi, Howard A Dobbs, Nicholas A Cadirov, James R Boles, Subhash C Ayirala, Jacob N Israelachvili, Ali A Yousef, Effects of salinity on oil recovery (the ‘dilution effect’): Experimental and theoretical studies of crude oil/brine/carbonate surface restructuring and associated physico-chemical interactions, ACS Energy & Fuels, 2017. Saurabh Das, Byoung Hoon Lee, Roscoe T. H. Linstadt, Keila Cunha, Youli Li, Yair Kaufman, Zachary A. Levine, Bruce H. Lipshutz, Roberto D. Lins, Joan-Emma Shea, Alan J. Heeger, and B. Kollbe Ahn, Molecularly smooth self-assembled monolayer for high-mobility polymer field-effect transistors, ACS Nano Letters, 2016. Rona Ronen, Yair Kaufman, Viatcheslav Freger, Formation of Pore-Spanning Lipid Membrane and Cross-Membrane Water and Ion Transport, Journal of Membrane science, 2016. Himanshu Mishra, Alex M Schrader, Dong Woog Lee, Adair Gallo, Szu-Ying Chen, Yair Kaufman, Saurabh Das, Jacob N Israelachvili, Time-Dependent Wetting Behavior of PDMS Surfaces with Bio-Inspired, Hierarchical Structures, ACS applied materials & interfaces, 2015. B Kollbe Ahn, Saurabh Das, Roscoe Linstadt, Yair Kaufman, Nadine R Martinez-Rodriguez, Razieh Mirshafian, Ellina Kesselman, Yeshayahu Talmon, Bruce H Lipshutz, Jacob N Israelachvili, J Herbert Waite, High-performance mussel-inspired adhesives of reduced complexity, Nature Communications, 2015. Nadine R Martinez Rodriguez, Saurabh Das, Yair Kaufman, Wei Wei, Jacob N Israelachvili, J Herbert Waite, Mussel adhesive protein provides cohesive matrix for collagen type-1α, Biomaterials, 2015. Saurabh Das, Nicholas Cadirov, Sathya Chary, Yair Kaufman, Jack Hogan, Kimberly L Turner, Jacob N Israelachvili, Stick–slip friction of gecko-mimetic flaps on smooth and rough surfaces, Journal of the Royal Society Interface, 2015. Saurabh Das, Dusty R Miller, Yair Kaufman, Nadine R Martinez Rodriguez, Alessia Pallaoro, Matthew J Harrington, Maryte Gylys, Jacob N Israelachvili, J Herbert Waite, Tough Coating Proteins: Subtle Sequence Variation Modulates Cohesion, Biomacromolecules, 2015. Nadine R Martinez Rodriguez, Saurabh Das, Yair Kaufman, Jacob N Israelachvili, J Herbert Waite, Interfacial pH during mussel adhesive plaque formation, Biofouling, 2015. Michael V Rapp, Stephen H Donaldson, Matthew A Gebbie, Saurabh Das, Yair Kaufman, Yonas Gizaw, Peter Koenig, Yuri Roiter, Jacob N Israelachvili, Hydrophobic, Electrostatic, and Dynamic Polymer Forces at Silicone Surfaces Modified with Long‐Chain Bolaform Surfactants, Small, 2014. Jenia Gutman, Yair Kaufman, Kazuyoshi Kawahara, Sharon L Walker, Viatcheslav Freger, Moshe Herzberg, Interactions of glycosphingolipids and lipopolysaccharides with silica and polyamide surfaces: Adsorption and viscoelastic properties, Biomacromolecules, 2014. Yair Kaufman, Sarina Grinberg, Charles Linder, Elyahou Heldman, Jack Gilron, Yue-xiao Shen, Manish Kumar, Rob Lammertink, Viatcheslav Freger, Towards supported bolaamphiphile membranes for water filtration: Roles of lipid and substrate, Journal of Membrane Science, 2014. Dong Woog Lee, Xavier Banquy, Kai Kristiansen, Yair Kaufman, Joan M Boggs, Jacob N Israelachvili, Lipid domains control myelin basic protein adsorption and membrane interactions between model myelin lipid bilayers, Proceeding of National Academy of Sciences, 2014. Yair Kaufman, Sarina Grinberg, Charles Linder, Elyahou Heldman, Jack Gilron, Viatcheslav Freger, Fusion of bolaamphiphile micelles: a method to prepare stable supported biomimetic membranes, Langmuir, 2013. Roy Bernstein, Yair Kaufman, Viatcheslav Freger, Membrane Characterization, Encyclopedia of Membrane Science and Technology, 2013. Saurabh Das, Stephen H Donaldson Jr, Yair Kaufman, Jacob N Israelachvili, Interaction of adsorbed polymers with supported cationic bilayers, RSC Advances, 2013. Yair Kaufman, Viatcheslav Freger, Supported biomimetic membranes for pressure-driven water purification, On Biomimetics (Intech), 2012. Yair Kaufman, Roni Kasher, Rob GH Lammertink, Viatcheslav Freger, Microfluidic NF/RO separation: Cell design, performance and application, Journal of Membrane Science, 2012. Moshe Herzberg, Amer Sweity, Matan Brami, Yair Kaufman, Viatcheslav Freger, Gideon Oron, Sophia Belfer, Roni Kasher, Surface properties and reduced biofouling of graft-copolymers that possess oppositely charged groups, Biomacromolecules, 2011. Sarit Bason, Yair Kaufman, Viatcheslav Freger, Analysis of ion transport in nanofiltration using phenomenological coefficients and structural characteristics, The Journal of Physical Chemistry B, 2010. Yair Kaufman, Amir Berman, Viatcheslav Freger, Supported lipid bilayer membranes for water purification by reverse osmosis, Langmuir, 2010.